Yes…we have finally installed the shiplap on the bedroom wall! It’s taken a while but it’s all up and ready for its debut. When we started this room, way back in April, I knew it would be slow going but I didn’t think it would be 4 months slow. We have already painted the ceiling and trim, installed crown molding and a DIY light fixture, but the biggest problem has been the water damage on the window wall, where the planks are. We think that the chimney, which is located where you see the primed planks, was leaking where it meets the roof. After some handy roof work by Mr. C² we are hoping that the problem is fixed…fingers crossed. After the roof was fixed, we pulled some of the old plaster off and cut holes in the wall where the leaks were to make sure there was no mold behind the wall. Thankfully it was mold free and it stayed dry for the two months we left it open, so we patched up the holes and primed with some Kilz. Then I painted a coat of BM Gray Owl on the whole wall (just in case you could see the wall between the planks). Putting up the shiplap has been the easiest part of this project. We used 2 very thin sheets of wood, which we had ripped into strips at Home Depot (I think we paid about $20 for both pieces). I didn’t want this to be a complicated task of measurements and mathematics, so we just kind of slapped them up on the wall. We did need to do a little bit of measuring around the windows and the return vent at the bottom of the wall but it wasn’t difficult. 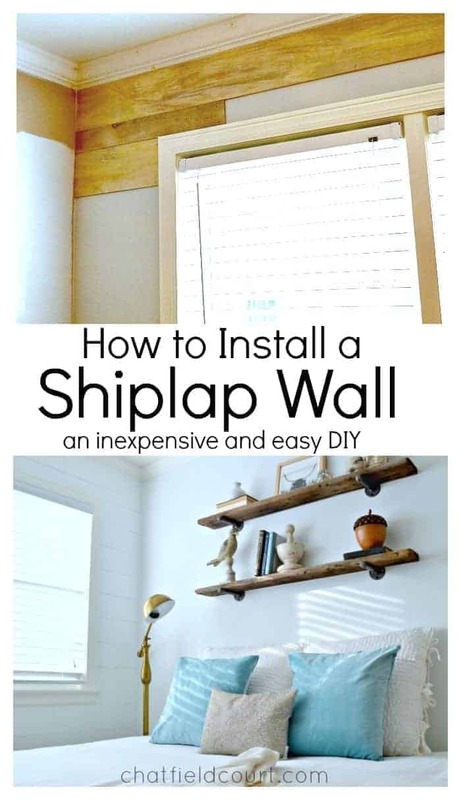 There are many different kinds of wood you could use for a shiplap wall. 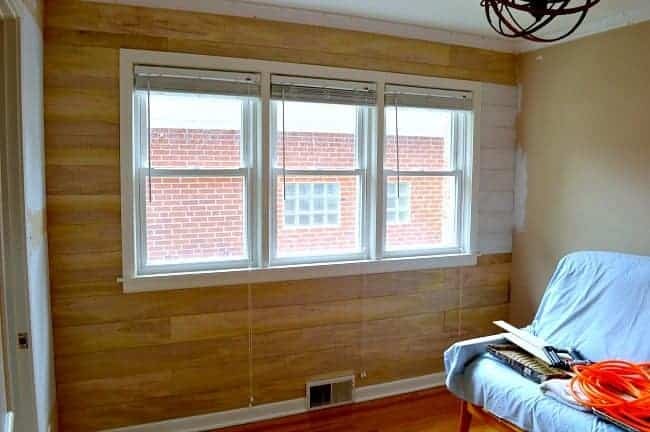 We chose this particular wood because it was cheap, it was easy to use, it was cheap and, because I had planned on painting the wall, we didn’t need to use expensive wood. 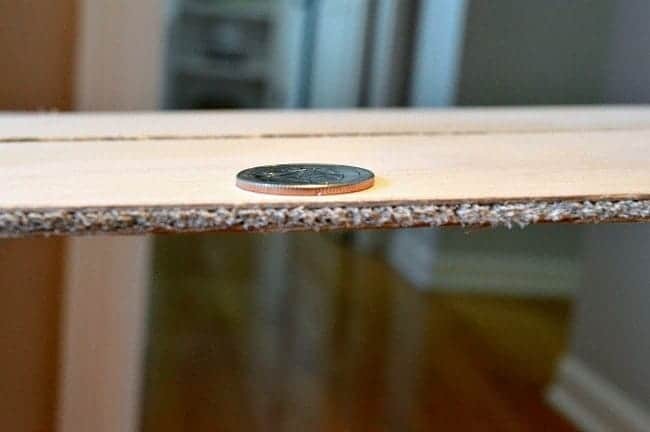 Just to show you how thin the wood was, I used a quarter as a reference. It went up pretty quickly taking us about 2 hours to cut and put all up. I spent another hour spackling and sanding all the nail holes and, once the wall was done getting prepped, 2 coats of BM Palest Pistachio finished it off. I’m thrilled with the results and would love to have it in another room, maybe cover all 4 walls. Woohoo…living on the edge! 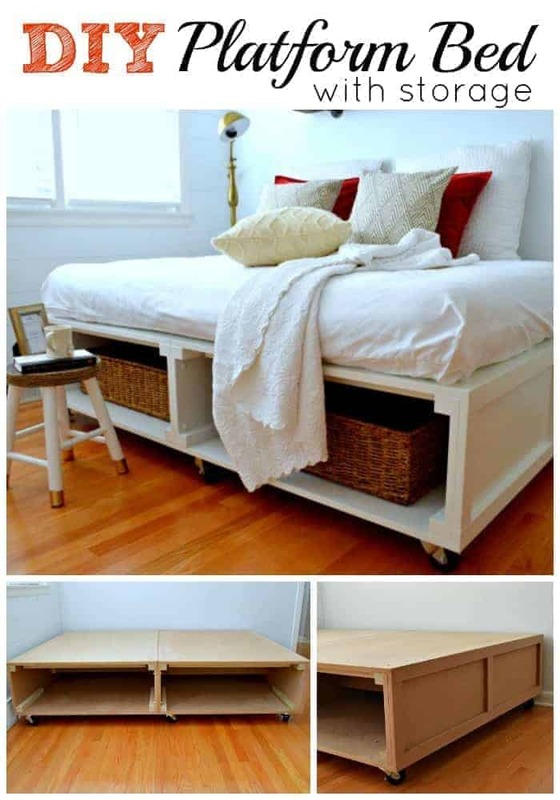 Want to see some other projects we’ve worked on in the guest bedroom? Love the ship lap!! We are moving to a house with a bunch of ***ugly*** textured wallpaper and I am thinking about covering it with this material. 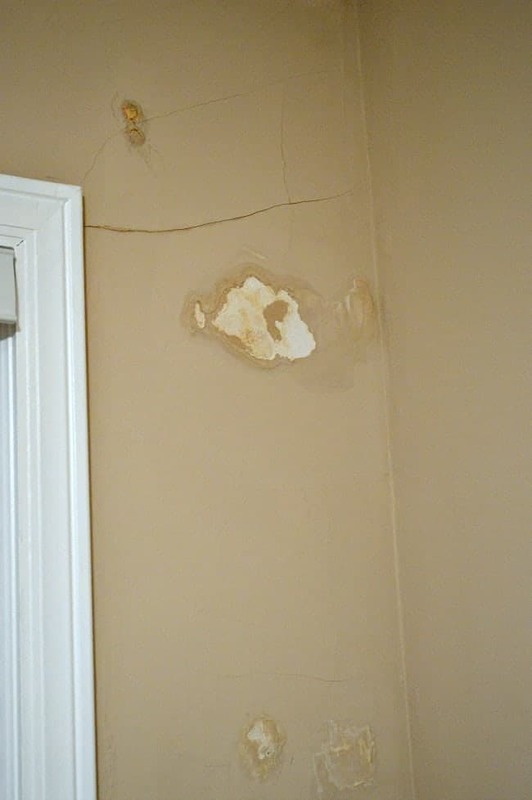 My question is about sealing the wallpaper with primer first or if I should just cover away and try not to think about what’s underneath. I guess I am thinking about making the surface sealed so that dust, allergens, etc. on this nasty fabric wallpaper are sealed. There is no visible mold/mildew but I am wondering about normal room humidity causing something to grow under the wood. Maybe I am over thinking this—but just want to avoid a major problem down the line if I can help it! I’m not an expert but I would think that you could cover the wallpaper just fine. 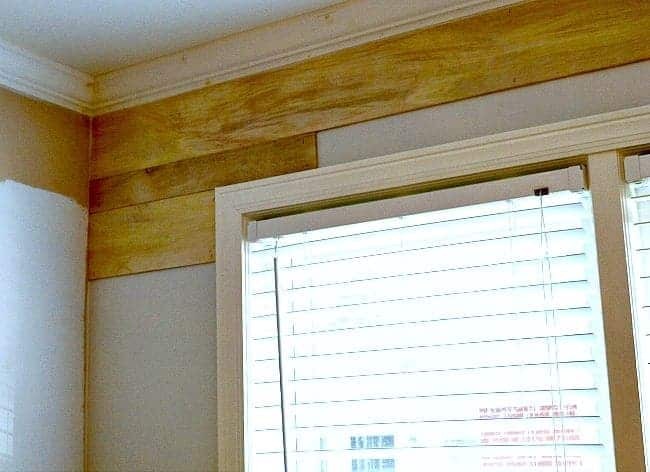 With that being said, if you plan on having gaps between your shiplap boards, I would do a quick cleaning of the wallpaper and then put a coat of paint on it so that you don’t see any strange patterns or colors through the gaps. I painted the wall with one coat of paint before we put our shiplap up, just in case. Hope that helps. Let me know if you have any other questions. Best of luck in your new house. You are not going to believe this, no really you are not! I have this same window and wall problem. What did you get for wood? I am all over this. I have wanted to do something for a long time (years) and just did not know what. I was thinking wainscoting. But I did not want a whole wall in it. This is great! And I am loving the light too. Wow Thelma, I can’t believe that you have the same set-up. We used a particle board type of wood from Home Depot. It came in a sheet and we had them cut it down in the store for us. I wanted to use something that was thin (so it didn’t stick out further than the window trim) and easy to work with. This was really a cheap, quick and easy project to do. Thanks about the light too. I’m loving it in my room. I would love to hear from you if you give this project a try. 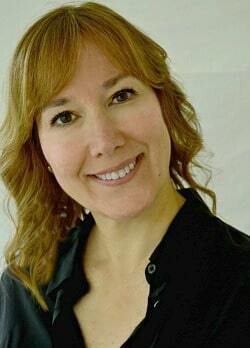 Thanks so much for stopping in and if you have any more questions, don’t hesitate to ask. WOW, the wall looks awesome!! I am a huge fan of wood plank walls. 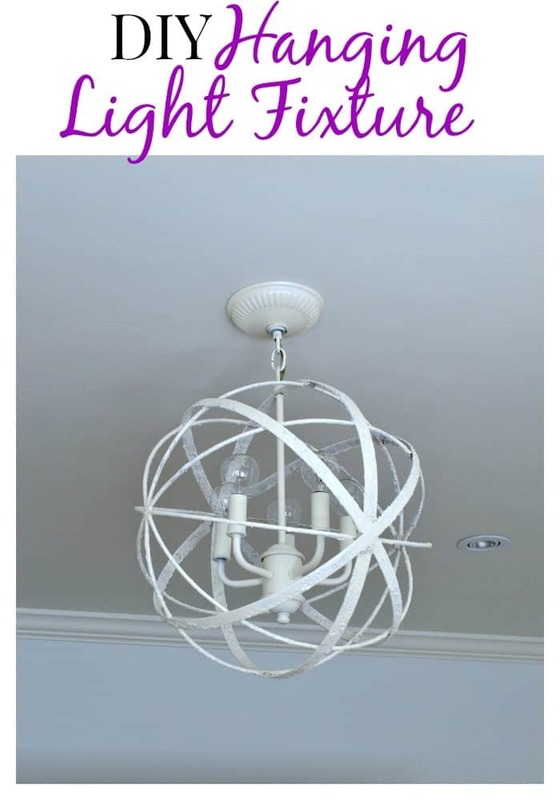 What a great way to patch up water damage and give the room some character at the same time. Thanks so much Susan! So glad you and Bentley stopped by. Thanks so much Judy. It’s my first planked wall and I’m really surprised how easy it was. I hope it looks good once it’s painted. 😉 I hope you give it a try on your wall. I would love to see it if you do. Good luck on your move and thanks for hoppin’ on over from Inspire Me Please. Your wall turned out great. I ‘m thinking about adding a planked wall to my bedroom. I just love the look. Good luck deciding on a bed. Looks really good. Just for future reference, you can also use wood flooring. Sometimes people on Craigslist try to unload their spare flooring for a really good price. And it’s usually enough to do a wall. We did this with bamboo flooring on the ceiling of one of our spare bedrooms. You don’t have to use nails, just construction adhesive. And since all the boards are tongue and groove, no gaps! Thanks so much for the great tip Beth! This looks so nice. I’d definitely paint it white! I’m currently helping my friend redo her kitchen, and am trying to convince her that a white planked wall is a great decision! We just planked a room in our house too ! I love real wood planks/logs but also like them painted out. I think it depends on the home and how one decorates. I plan on adding horizontal planks on the lower half of the stairway wall leading to the basement plus one small wall at the bottom of the stairs where we need to add insulation. Thankfully we have not encountered any water leaks in our house. Just leaking plumbing which seems to be a constant and costly issue. 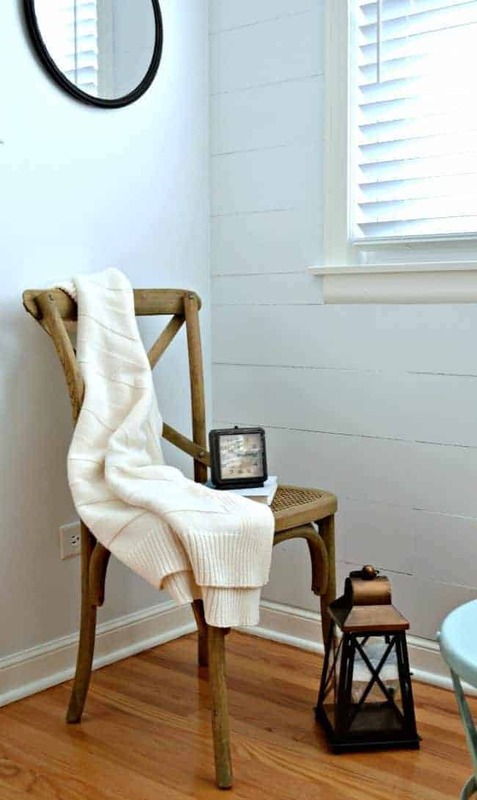 Adding the wood to the wall not only adds visual interest, it’s a great way to cover a less than perfect wall surface. Looking forwards to seeing the completed room. Plumbing problems are the worst, as are roof leaks. This is the first time we’ve dealt with a problem like this so I guess we’re lucky. So glad you stopped by today. Thanks for commenting. When you said you were going to put planking on the one wall I couldn’t imagine what it would look like. To tell you the truth I didn’t think it would look good at all. If you could see me you would see a face like I just ate something sour! Well, I really like it! I think it looks great! I know you want to paint it, but I kinda like it unpainted. We had a leak in our roof where the roof line meets the new garage addition and the leak was in my dining room. We could see that the ceiling was sagging in one spot and when I pointed it out, my husband, just as I was about to say, don’t push on it, he does and his hand went through. Obviously we had to patch the ceiling and he had to find the leak in the roof and fix it. Haven’t had any leaks since. It took awhile, but great job! Oh ye of little faith MJ! LOL I was more worried about fixing the leaks than the look of the planks. I’m glad they look ok though. My husband doesn’t want me to paint them either but they really aren’t a good wood to leave unpainted. Roof leaks are the worst. I’m just hoping we don’t have to worry about it again. Glad that you were able to fix yours. The photos must be deceiving because the wood looks fine, a little rustic, but I like that!